Barcelona Card city pass. 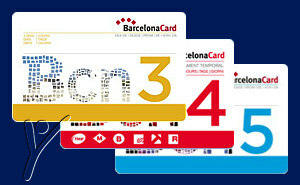 3, 4 or 5 consecutive day Barcelona city card with discounts, free entry, guide book and map. The Barcelona Card is the official tourist card and city pass of Barcelona. The Barcelona card includes free public transport on city buses and metro, over 100 free or discounted admission to top sights and free guidebook and map. Choose from 3, 4 or 5 consecutive day city card and receive free entry, over 100 discounts and offers to Barcelona's major attractions.